For nearly 40 years, Walmart and the Walmart Foundation have been committed to strengthening local communities around the world. Volunteerism Always Pays (VAP): Encourages associates from Walmart, Sam’s Clubs and Logistics facilities opportunities to volunteer for causes in their local community. 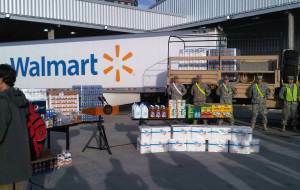 Through VAP, Walmart makes contributions to eligible organizations where associates volunteer. Associate Giving Program (AGP): Gives associates the opportunity to support participating organizations through payroll deduction, including the United Way. Disaster Relief and Resiliency: Walmart has a long history of supporting communities around the globe when impacted by disaster. Last year, Walmart and the Walmart Foundation invested more than $1.5 million to: strengthen technological infrastructure for disaster response and resiliency, build capacity to facilitate skills-based volunteerism during disasters and convene leaders in disaster relief to share best practices. Additionally, Walmart and the Walmart Foundation co-hosted a two-day forum on disaster resiliency to search for opportunities to share best practices to help communities build resiliency. Facility Giving: Walmart awards grants to local organizations making a difference on key issues in communities where Walmart Stores, clubs and distribution center associates live and work. In FY15, over 46,000 grants equaling more than $47 million were provided to organizations, including law enforcement agencies, fire departments, schools, recreation centers and more. Giving Programs: The Walmart Foundation awards funding through its local, national and international giving programs. Information about the programs and how to apply can be found at foundation.walmart.com.